oh I cannot wait to get a copy of this book!!!! So awesome you did this. Love all your freebie images that you post for us. The first two books were fabulous, so I'm sure this will be a great hit also! Thanks for all you do and for the chance to win a copy. Would love to have one signed by you! Too funny, I love the image where you're throwing darts at yourself!! And I would love to win a copy of this latest book! I feel your pain about self portraits. I don't draw but I am always the one behind the camera instead of in front of it. I would love a copy of this book, thanks for the chance. HA! LOVE your self portraits! If I had to do one I'd probably draw me as a cartoon too, I'm not really comfortable with all of my flaws. Really terrific coloring. I can't wait to get this book, there's so much I need to learn! Just love your self portrait. It made me smile and think I can totally relate to that feeling. Amazing book and can't wait to get my hands on it, so thank you for the chance to win a signed copy. LOL I LOVE the dart throwing pic!! Congrats on your third edition!!! I can see it will be a fabulous one! I am SO excited about this book! I have the other two, and they are great resources, but this is the one I really need!! 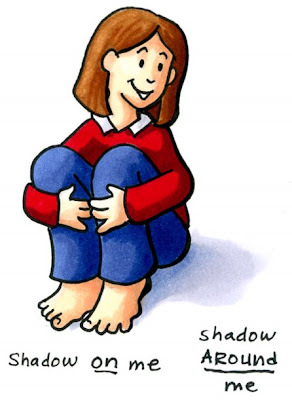 I love your insight into self portraits... and they are cute! Thank you for making these books come about. I would be truly honored to have a book autographed by you! Thank you for the opportunity to learn so much and to keep sharing the love of Copics. Have purchased the first two, more markers and ready to learn, so getting this would be awesome. Thanks for the opportunity. I would love a signed copy of your Amazingness! I talked to you a short time when I visited the MerryArtist...I sure would like the new collection! Great idea for a book. I really need some help with my hair coloring. Love all the book you and Marianne have published. I ordered this one a couple days ago! Carry on! I LOVE your self-portraits! Very clever and creative and your coloring is great! Wishing you a happy weekend! What an outstanding artist you are. I love all your self portraits. I want to be able to color like all the fabulous people that participated in this book. Please pick me. You goof . . . I love your self-portraits, especially the darts!! LOVE the dart throwing you. Hilarious! Thanks for teaching all of us how to create with Copics. Thanks for covering colouring people... a challenge to do and all the tips are appreciated although I know it will be a long long time (perhaps I need to add a few more longs to that statement) before I will enjoy my own efforts as much as I appreciate yours! I would love to win a copy of this book. This is my first time blog hopping, am I hop I have done this right. I enjoy coloring with copics, but my techniques need some help and this book would be a great resource. I was planning to buy one regardless. But an autographed copy would be pretty darn cool!! Copic Coloring Guide, Level 3: People! What a fantastic resource. I always have a problem with hair, skin coloring and making clothing look real I know this will help me. Thank you for the opportunity to win this book. Thank you for the opportunity to win this wonderful third book in the coloring series, and thank you for the short tutorials shown here on your blog. Ijust found you !! A wonderful blog for inspiring me to get my Copics out again and start to color. Thanks! oh wow, can't wait for the book. I'm a big fan from your books and your blog :-)). Funny the way you see your self.....love the pic that you are throwing darts to your self!!!! JAJAJAJAJA!!! !It would be great to win this copy.... Anyway thanks for the chance to win....love your blog!!!! Since I've had my copics I've been amazed at what I have achieved but hair is something I find a challenge so I would love this book so I can discover the right techniques. Congrats on the book...You are the Queen of coloring....Thanks for the chance to win!! amazing new book..would love to win it...thanks for sharing ! This book looks amazing! I can't wait to get my hands on it! Hoping to win! The shadow on your image is very cool! Wow what a wonderful and inspiring hop this has been! Congrats on another book, loved the first two and look forward to getting my hands on this one! Thanks for such a sweet insight into your world! I love my first 2 Guides and would love to have this new one signed! What a treat! Thank you for the wonderful free images. They help me with my coloring. So would this new book, so thanks for the chance to win it. Congrats on the new book! I can't wait to get a copy! Wow, this book looks awesome and just what I need to help me with my coloring skills. I would love to win an autographed copy. Thanks for the chance. Wow! this book looks amazing! I can't wait to get my inky fingers on it...thanks for the chance!! Great self drawings and hair story. Congratulations on the new book and love your work and can see that this book would help me. I have fabric/clothing issues and people coloring hair, skin I would love to have this book as a good referrence. Thanks for the chance. I'd love to see you color that bottom portrait! I love it. More importantly, thanks for all the wonderful tutorials, tips, and artwork you so freely share with all of us! Marianne, thank you so much for this book! I desperately need more guidance on coloring people. I bought the 2 previous guides and would love to add this to my collection. Thank you for the chance at winning it. love your blog, thanks for the chance and congrats! Skin and Hair. Oh my! Skin and Hair Oh my! Sin and Hair Oh my. After going through the blogs I can definately say that you do have differnt styles. Each is just as beautiful as the next. Thank you so much for giving me the chance to win this book. I haave enjoyed the other two and look forward to seeing all that is in this one. A guide and a cd? I need this! Your self portrait is adorable! I am so excited about book #3. I love the first two books and cant wait to get me hands on this one too!! Thanks so much. Thank you so much for sharing your talents with us. I would love a copy of the book! I can't wait to get my hands on this book...the previous 2 were fabulous...I can only imagine this one will be as well! I'd love to be the winner of this book!!! I would love the opportunity to win this fabluous book. I love the first two booksand have learned a lot with them, so I am excited to get the third one to see where it takes me. HA! I love your original self portrait. I'm not talented enough to draw my self portrait, but I do hate looking at photos of myself, so it's kinda similar, right?! Thanks for the chance to win! Awesome hop!! would love to win a copy of this book!! Will have to go and buy book 1 and 2 now!! love that its available for download!! Oh my gosh! I love your blog as I am new to Copics. 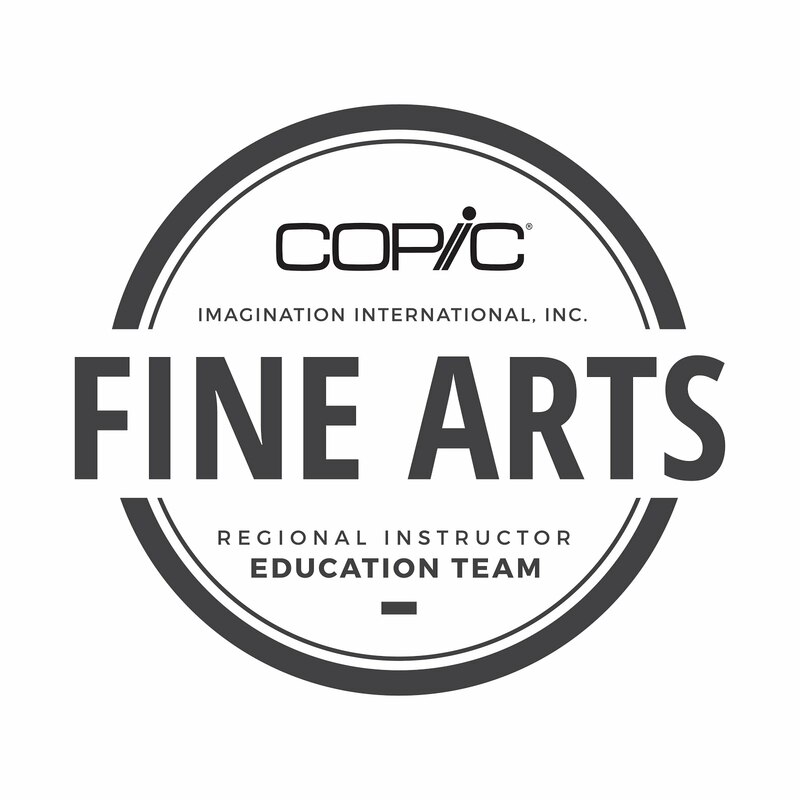 I'm hoping to take a class with you if you come out to Southern California! I cannot call myself an illustrator - I just enjoy coloring - a self-portrait of me would be a stick figure (well a fatter stick figure!0. Thank you for the chance to win a signed copy of your book! so cool! I love it! wow a self portrait .. what a great idea. I am just getting started with Copics but practice makes perfect and that's what I'd like to be with coloring. I'd love a copy of your newest book! Thanks for the inspiration! I love your self portrait. Wouldn't we all love to have the time to lay on the floor colouring to our hearts content? Thankyou for the amazing images you share with us through your blog and books. Congratulations on the new book, I have learnt so much from the last two. Thank you for the chance of winning a copy of the new book! THIS is the book I've been wanting for the longest time! Thanks for putting it together, and congrats on it's publication! 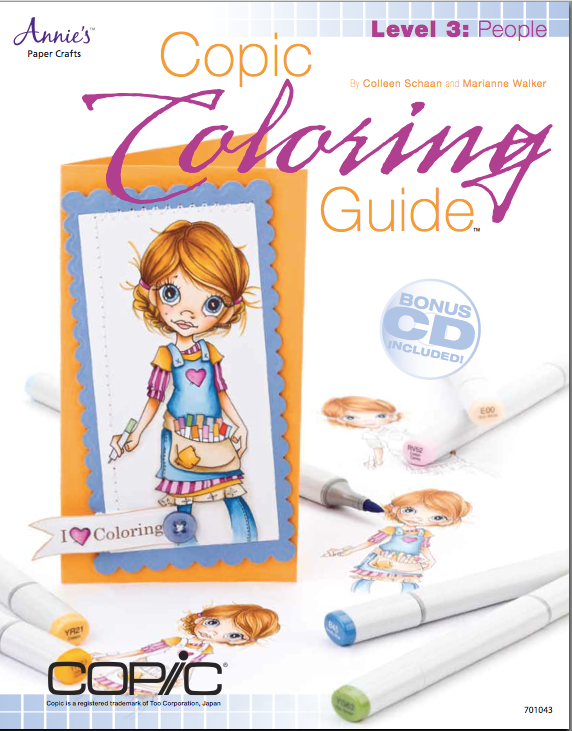 Oh, I would love to win this new Copic Coloring Guide (really loved level 1+2!). What an awesome book. There's a style in here for everyone. Love it. Even though you don't like self-portraits, you are good at them. Would love to win the book and learn to color the right way. Great job on your self portraits so much fun. Congratulations on the book. Can not wait to get mine. I loved books 1and 2! Can't wait to get book 3! I am so excited to have this book available! People are often featured in my work, so I look forward to having more instruction and practice on making the images even more realistic. I have learned so much from the previous 2 books - I think your series is invaluable. Ha ha...I have to laugh at your three-fingered image! Several years ago, I free-handed an angel looking out a window, in our sunroom. I was pretty proud of it. Then DS came for Christmas break, and said, "mom, do you realize that your angel has 5 fingers and a thumb on one hand?" Guess what - she still does! Love your images, and can't wait to get this book! How thrilling if it was signed by you! Thanks for the chance to win, and Congrats! What a hoot! LOVE your self-portraits but especially the three-fingered dart-throwing portrait lol. 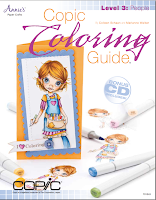 Thanks for the chance to win an autographed copy of this newest coloring guide. Love your portrait! Thanks for the chance to win this cook, I'm anxious to own it! Great blog hop ... so many beautiful works of art. Looking forward to book 3 and than you for the opportunity to win a signed copy of this new book. Thank you so much for sharing your talent! I love to follow your blog, as it is so informative. You bring gentleness and kindness to your colored images and the way you teach use your techniques. Thank you! Congrats on your latest publication Marianne! Your blog first inspired me to try Copic Markers and I've been stuck on them ever since! Thanks for all your beautiful inspirations and sharing your talent. We truly appreciate it! What an amazing book. I LOVE Copic markers but don't feel like I am very good at coloring or shading because I dont have an art background. Thanks for a chance to learn and become better!! Congrats on the new book, I love your coloring and have learned a lot following you. I love your self portrait, you look so happy just laying there coloring with your copics. I ;ove these books and would love the chance to win the latest one. I love your self portrait. That is how I like to color too! So excited about your new book. Would love a copy of a signed one. Thanks! Thanks for the opportunity to win this book! I love your self portraits! Your Copic coloring books have been very helpful. Thanks for the chance to win. Thank you Marianne for the chance to win!!! So appreciate your sketches and tutorials! I love this new book and can't wait to practice coloring with it. Everyone has done a beautiful job on it. 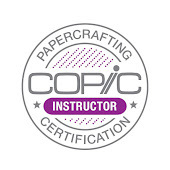 I also want to thank your for the great training on your blog and in your classes. These books are all on my Christmas list! Thanks for publishing such a great collection of books for us crafters. They are truly amazing. Great work! I love your cartoon self-portraits! And I'd love to have your latest book! Congratulations on book 3!! I love your self-portraits, hoot! Thanks for the chance to win a copy. I stumbled across this blog about 3weeks and have found it extremely helpful! :) I just wanted to say thank you! Love your blog! You are such an inspiration! Looks like a great book. Can't wait to have my own copy! Great to see those self portrait pics especially the darts one. Thanks for the chance to win the book. At least you can draw a self portrait and be at your own mercy. I liked your younger image. Can't wait to see the book. Adorable self portrait. The book will be great, but signed will be terrific, good-luck everyone. I envy your ability to draw. :-) Congratulations on the new book! Congrats on your publication of this cute image. She looks so relaxed and enjoying her coloring; wish we could all look like that. Beautiful coloring and shading. Hope I can win this new book and improve my coloring and shading. Oh Marianne I would still have to buy another book because one autogrphed by you would be priceless! So exciting! I'm swooning! Marianne - I love your self-portraits (past and present). thanks for giving us the opportunity to color in your latest portrait. I'm glad the new book is available. Congrats on your new book, Copics Coloring Guide Level 3: People! Love books 1 & 2 - they're so beautifully done and soooo helpful. Thanks for the chance to win an autographed copy of your latest book. Thank you for sharing you talent. I would love learning new techniques and using this resourse. Much continued inspirations and TFTOTW! Congrats on your new book. I would love to be able to learn new coloring techniques. Thanks for a chance to win. This new book looks awesomeeee. I need help with my coloring that's for sure. Congrats and thank you for a chance to win a copy! Thanks for sponsoring this blog hop! I'm almost all the way through it and have really enjoyed it so far. I have book #2 and now can't wait to see book #3! Great job!! So excited about this book! And I love your self portraits - especially the last one! I love your wonderful sketch! You know I am a fan of your wonderful coloring! I have book one and two and I can hardly wait to get my hands on book 3! Thank you too for all the tutorials you do on your blog. I love the pumpkin tutorial! I love your sketch and coloring! thank you for your wonderful tutorials! I love the pumpkin tutorial you recently posted. I have your first two books - I can hardly wait to get my hands on # 3! Congrats!! I always love looking at how you color in your projects. Would love to win this book since I'm a Copic newbie. Thanks for the chance. Very excited for the new book! Congratulations! I am looking forward to this book to see new coloring techniques! Do you really color on the floor??? Anyway, love your honesty and just wanted you to know how helpful you have been to all of us, and thank you for the chance to win a copy! Congratulations of your newest publication!! i love all of the tutes you have on your site. and your humor just makes me roll. congrats on the book and i so hope i win. i can use all the help ouit there. Apparently I have been hiding under a rock because this is the first time I have seen your blog. You are very talented and I look forward to seeing more of your work! Can't wait to see the book -- love your self portraits. Awesome...can't wait to check out a copy of this great reference book! Thanks for a chance to win! I think your self portraits are fabulous! So excited to get a copy of the newest book. Thanks for the fun blog hop and offering a chance to win a copy. Would absolutely love a copy of this book. Love your self portraits. Thanks for the chance to win. What talent you have! So jealous! Can't wait to get a book! Thanks for all the hard work you've put into this guide. I would be so thrilled to have a copy signed by you. Love the first two guides. Can't wait to get this one too. What a fun hop! The book looks marvelous. Thank you for the chance to win a copy. I would love to win a copy of the book, thanks for the chance! I always love your drawings (& coloring!). Already bought the book - love it - but it would be fantastic to have a signed copy! Would love to get a copy. Nice drawing, Great book. Thanks so much for the hop. It was great fun and I could certainly use some instruction in using my pens better. Ha! Love the dart-throwing image! This book looks like it'll be a great, detailed tutorial. Crossing my fingers that I win a copy! And if not, I'll need to schedule a visit to my LSS! Wow. 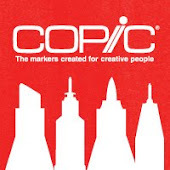 Congratulations on yet another book filled with information to help those of us just starting out with copic markers. Thank you so much for the opportunity to win this oh-so-awesome book!!! Oh and just a quick thanks for the freebies you post. They are very appreciated too! Great job on the book! Thank you for the opportunity to win a copy! Wowzers... what amazing inspiration. Thanks so much for sharing all your talents with us. Such a wonderful job! I love the images and the shading- including the shadow behind her! Your image is wonderful and I am very excited about this book! Amazing work, as always!!! LOVE that you're doing these books as I NEED the help; would be thrilled to win!!! Ohhh a people book. I cannot wait to add this to my collection. Thank you for the chance to win a copy. I love your tutorials and have a copy of the second book (and love it), but I just can't seem to get my faces to look right...so this book is a must have! Thanks for the chance to win! Thank you so much for the chance to win that cool shirt! Very fun! Hi Marianne, I think your first portrait would be me too, in an ideal world and if I didn't have to work. Like you I'm always in a rush and should of done it the week before too, lol. Awesome work as usual, can't wait to see the book. Thanks for the opportunity. Would be fabulous to win a signed copy. Marianne, so excited for book # 3, wow this hop was amazing, looking forward to seeing the book in person as these pictures in the hop are gorgeous! This looks like a great book and it would be so useful! Great book! Looking forward to this book! I can hardly wait to see this new resource! !